Iterate Design + Innovation will use £1 million Innovate UK Grant to develop a 3D printing solution combining conductive inks with polymers. The UK-based engineering design consultancy Iterate Design + Innovation has been awarded the Innovate UK grant to help develop an advanced 3D printing technology. Based in South Wales, Iterate consists of a team of design engineers who aspire to help their clients create original products. The grant is worth over £1 million and will see Iterate collaborating with researchers from the University of Warwick, Printed Electronics Ltd. and C Enterprise (UK) Ltd, the minds behind the acclaimed CEL Robox 3D printer. Collectively, the team will work to combine deposition of polymer-based materials with electrically conductive inks. This could potentially help to replace wires used in electro-mechanical products. Throughout the 18-month long project, the team at Iterate will be reaching out to product manufacturers as well as end users to get feedback on the additive manufacturing process. 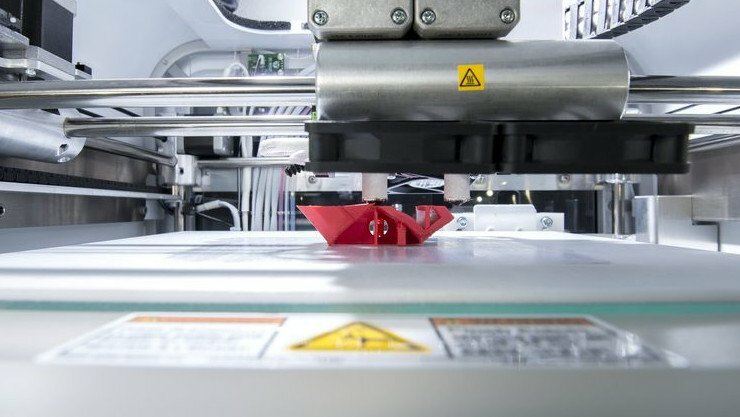 The goal is to create a 3D printing technology that can offer unique benefits to products by combining plastics and electronics, thus reducing their weight, cost, and complexity. “Current 3D print technology is based on a Cartesian co-ordinate system (X,Y,Z), depositing one layer of material on top of another in a single plane to create a 3D object. This method has inherent limitations that affect surface finish, geometric tolerance and robustness. This project will overcome these challenges so that industry can cost effectively develop new products across an exciting array of market sectors – spanning military to healthcare,” he adds. Innovate UK is the operating name of the UK Technology Strategy Board, the government’s innovation agency. Launched in 2007, Innovate UK supports country-wide innovative projects through financial grants and by connecting partners and teams. In addition, it provides help for small business development. We’ve seen similar hybrid 3D printing technologies in the past, some of which have also come from the UK. For instance, earlier this year, engineers from the University of Sheffield developed a 3D printing process called “THREAD”. This technology allows users to add multiple materials, such as electronics or optics, into one 3D printed component. Now, with a £1 million grant at their disposal, Iterate Design + Innovation hopes to take things a step further, ushering in a new age for 3D printed electro-mechanical assemblies. License: The text of "UK Design Startup Receives £1 Million Innovate UK Grant to Boost 3D Printing Development" by All3DP is licensed under a Creative Commons Attribution 4.0 International License.